It had been a trying and difficult week, and the fact that wickedly strong winds were now ruining our weekend plans, it was difficult for me to play make-believe. Brilliant. I smiled at my daughter and said, “Come on.” In the garage we found the kite, then rushed outside. The wind, the evil intrusion on our plans, was suddenly transformed into sport. 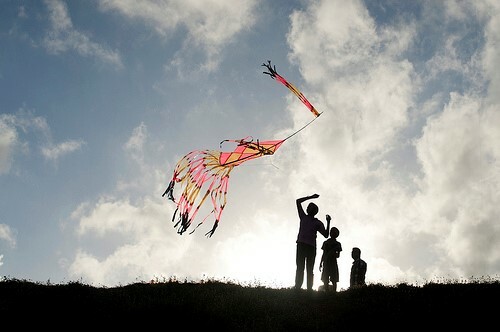 Time and again we put the flimsy kite into the air, and always it spun from the sky and crashed to earth. We wouldn’t be denied. With each attempt our laughter increased. My daughter’s ‘we’re-going-to-have-fun-and-there’s-nothing-you-can-do-about-it’ attitude infused oxygen into our moment. From it came an ingenuity I didn’t expect: We started with a kite and finished with an unrecognizable, yet effective wind-riding contraption. It seemed to float on a child’s screams of delight. Someday my daughter may say that as her parent I gave her the gift of time. This may be so. It is the children, however, that give me the gifts: I need them to remind me that my focus is the key – and that I can transform frustration into inspiration.